Preparing Your Vehicle for a Road Trip! Is your vehicle up to date with an oil change? If not, scheduling an oil change at Wetzel Auto is easy with our online chat, or by telephone at (765)966-7000! Does your air conditioner work properly? There’s nothing worse than a car full of hot and sweaty passengers. Grab a friend and verify that all of your lights are working. Getting unusual bulbs might be difficult on the road, and changing taillight bulbs when your trunk is full is annoying. Also make sure the windshield wipers are in decent shape. This is the time to install a new set if you need them. Are your tires properly inflated? Check both the tire pressure and tread. If your tires are under inflated or lack proper tread depth, it could be disastrous on busy highways. Flat tires aren’t terribly common these days, but they’re no fun, so make sure you’re prepared. Check your spare’s air pressure and perhaps even inflate it a few psi above the recommendation so it will be ready even after a long trip. Make sure that your jack, lug wrench, and other tools are in their proper place. If your car has tire sealant instead of a spare, make sure that your can is full of the magic goo and that the air compressor works. Make sure your GPS system is up to date. This will make it easier to reach your destination as well as navigate to various locations during your trip. With luck, nothing will go wrong on your trip, but having a few screwdrivers and wrenches can’t hurt. A flashlight is nice in case, say, a flat happens at night; make it a head-mounted lamp if you’re traveling solo. Check your key fluid levels—engine oil, engine coolant, transmission fluid, power-steering fluid, brake fluid, and windshield-washer fluid. Is your car’s interior clean? Making sure that the interior of your vehicle is clean and organized prior to leaving can make the trip more enjoyable for all passengers. Now’s also a good time to check the fluid in your battery, if that’s possible. If your battery terminals show corrosion (It often looks like dried toothpaste), pull off the cables and clean the terminals properly. And having a set of jumper cables is never a bad idea, particularly if your vehicle’s battery is older. For any of your vehicle maintenance needs, give Wetzel Auto a call at (765)966-7000! 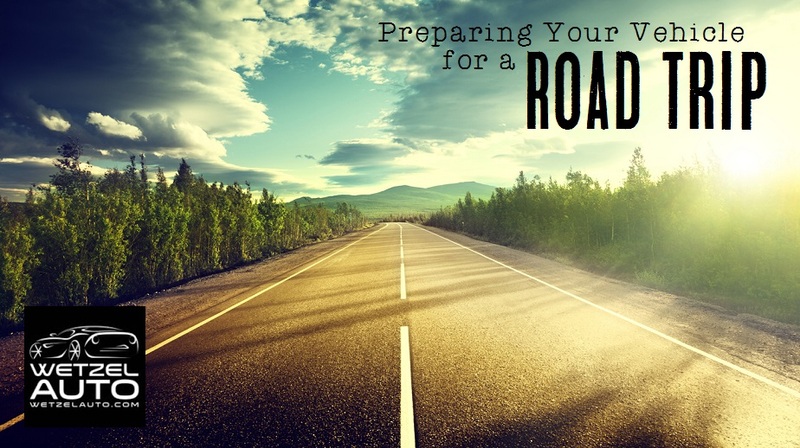 0 comment(s) so far on Preparing Your Vehicle for a Road Trip!